1512 yılında Amasya'da doğdu. Küçük yaştan itibaren Kur'an-ı Kerim, tefsir, hadis ve fıkıh dersleri yanında yüksek fen ilimlerini de öğrendi. Çok çevik ve zeki olup ok atmak, güreş tutmak ve kılıç kullanmak hususunda maharet sahibiydi. Arabi ve Farisi'yi mükemmel bir şekilde konuşurdu. Babası II. Bayezid padişah olduktan sonra , askeri sevk ve idare ile devlet yöneticiliğini öğrenmesi için Trabzon'a vali tayin edildi. Yavuz Sultan Selim is one of the greatest Ottoman emperors. He was a great poet, strong commander and a high statesman. Yavuz Sultan Selim is the son of Beyazid the 2nd His other brothers are Korkut, Ahmet, Mahmut, Alim Şah, Şehinşah. His mother is Gulbahar Hatun. Gözyaşımdan başka serpilecek su yoktur, when he fell in love. He was a terrifying conquerro. Land love is enough for me in the world. Ne hanlıkta mukayyeddir, ne de Hakana muhtaçtır. This world is not enough for a sultan! Yavuz Selim was really a stouthearted person. He was stout-built, he had the looks of a falcon and curved mustache. He was a charming man. He shaved his beard and wore one earring. He liked wearing simple clothes and eating simple food. He did not like adorning himself out. One day, his wife Hafize Ayşe Sultan made his son Suleyman wear an embellished cloth. Yavuz Selim, seeing his son in embellishment said: What will women wear if you are so much embellished? He was very tough indeed. He would never forgive a vizier when he saw mistaken, and beheaded immediately. The people called him Yavuz because of his heroism and toughness. His father Beyazid the 2nd appointed him as governor to Trabzon. He was both writing poems and being engaged in state affairs at the same time; he had a craft too. In Trabzon, his son named Suleyman was born. Yavuz Selim was thoroughly examining the situation of the country when he was a governor in Trabzon. The Shiite forces from Iran were making raids on Anatolia. He was so much saddened with that. Since his father was quite old, the perfect victories of Fatih period could not be seen. There were no great viziers to govern the country too. Yavuz Selim, depressed of this situation, wrote as follows to his father: "It is doubtless that it is not easy to accomplish state works. In my opinion, it is not appropriate for our purposes to have people who are statesmen at some positions. Maybe their loyalty may be taken advantage of. There are several people in all places of our country known for their knowledge and moral values. I tested some of your servants here for a long time. I saw that they are skillful. If they are grown, we can take advantage of them. Therefore, I dare to introduce them." He was considering knowledge and morals as the most superior qualifications. His father was not able to govern the state well enough now. Some scholars in Istanbul attempted to enthrone Prince Ahmet. Yavuz Selim, having heard of that, passed to Rumelia and fought his father's forces. At last he acceded to the throne with his own power as the ninth sultan in 1512. Yavuz Selim tried to realize two policies when he became the sultan. First was the eastern policy, elimination of Shiite Safevi State in Iran, and opening a gate to Middle Asia. The second was to conquer Egypt and possessing Indian Trade ways. He also wanted to become the Caliph of three hundred million Muslims taking Caliphate from the Arabs. He was strong enough to fulfil his desires. His army loved him. He had the power to command great forces. When Yavuz Selim acceded to the throne, Shah Ismail in Safevid throne was very active. He used to make raids on Anatolia. Yavuz decided to teach a lesson to Shiites in Iran. 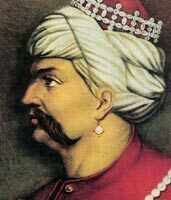 He established a divan in Edirne and prepared. His army departed from Edirne on 19 March 1514, and crossed to Anatolian side. Immediately Sinan Pasha, the Anatolian General Governor, attended th earmy. Grand Vizier Dukakinzade Ahmet Pasha pioneered. The number of all forces was 180.000 people. The soldiers got excited on this speech, and went on. The army arrived at Çaldıran Plain on 22 August 1514. Yavuz sent a woman dress to Shah Ismail. Iran army consisted of 120.000 people. In a short time, conflicts started in Çaldıran Plain. At last, Shah Ismail army was routed. He escaped from the battlefield. The victorious Turkish army entered Tebriz. Famous pearly throne of Shah Ismail became Turks'. The biggest but second war by Yavuz is "Ehramlar Victory". He fought this war against Cansu Gavri, Toman Bey, the ruler of Egypt Kolemens. Yavuz's forces met Egyptian Kolemens on 24 August 1516 in Mercidabık. He routed these forces and conquered Syria. Then Yavuz conquered Palestine with Gazze expedition and crossed Sinai desert and went to Cairo. He routed the forces of Toman bey in the vicinity of Ehramlar on 22 January1517. Egyptian country became Turkish territory. In this war, Kolemens killed Sinan Pasha, thinking that he was Yavuz Selim. Yavuz Selim, having heard that, said: Unfortunately. We conquered Egypt but lost Sinan!... Mutevekkil Alallah, the last Abbasi Caliph, delivered Caliphate to Yavuz Selim with holy trusts. After that, all Ottoman sultans became the caliph of all Muslims at the same time. Go tell Vizier! The army is departing tomorrow! Yavuz Selim departed after seven months and three days of staying in Egypt. He took 1000 camel load of gold and silver coins from Egypt and turned back to Istanbul. On the way, a piece of mud spread from the İbn-i Kemal's horse's leg touched the caftan Yavuz wore. Ibn-i Kemal went pale. Take this robe, keep it in my treasury. We respect the mud spread from the leg of scholar horse. After Yavuz Selim appointed Pir Mehmet Pasha as his grand vizier, departed to launch an expedition against Hungary with his army. But he got sick in Sirt village between Çorlu and Uğraş sub-district. The boil on his back had grown. When he got worse, he took Koran in one hand, and left his earthly life in 1520 in his 53 reciting Yasin sura. When his nine-year sultanate life full of victories ended, the world history had lost one of its greatest rulers. İSTANBUL’un fethinin 560. yıldönümünde temeli atılan 3. köprünün isminin Yavuz Sultan Selim olması kararının, son dakikada tören alanında alındığı öğrenildi. Edinilen bilgiye göre bugüne kadar herhangi bir adı olmayan projenin isim babalığını tören alanında Cumhurbaşkanı Abdullah Gül, Başbakan Tayyip Erdoğan ve TBMM Başkanı Cemil Çiçek üstlendi. Tören sırasında Başbakan Erdoğan, köprü için düşündüğü birkaç ismi Gül ve Çiçek ile paylaştı. Üçlü, alternatif isimleri değerlendirdi ve en uygun ismin Yavuz Sultan Selim olacağına karar verdi. Erdoğan ve Çiçek, köprünün adını Cumhurbaşkanının açıklamasının daha uygun olacağı önerisinde bulununca ismi Gül açıkladı.